The only wireless home alarm system that chases intruders away before they’ve even entered the premises. 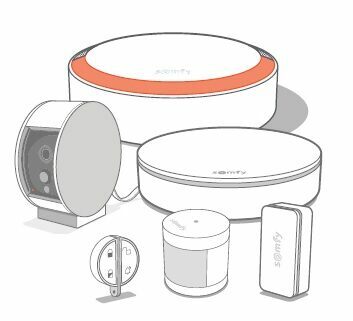 In addition, the Somfy Home Alarm Pack can be expanded to include additional cameras and sensors. For your convenience, you get two special key fobs that you can use to switch the alarm on and off. Even better, as soon as you get close to your house, the system ‘sees’ that you’re standing in front of the door and is automatically switched off. Which is really useful if you happen to have your hands full.To complete the package we added an outdoorsiren with flashlight for extra safety. Of course, the Somfy Home Alarm Pack can be expanded to include various handy accessories, such as cameras and sensors, for instance. The heart of your security system, it connects to your Internet through Wi-Fi and links all the elements wirelessly. Smart wireless doors and windows sensor, it sets a security perimeter around your house and detects intrusion attempts. Wireless, emits a loud 112 dB noise and bright flash in the event of a detection.